Available as a streaming audio file now is tonight's Williamstown selectmen's candidates night -- a one-hour forum sponsored by the Williamstown League of Women Voters and moderated by former selectman and league president Anne Skinner. The session lasted an hour. To listen to the audio, click on the carat at the start of the orange-and-white line below. WILLIAMSTOWN, Mass. -- The organizer of Monday night's four-way debate for selectman has issued a call for questions. Anne Skinner, president of the Williamstown League of Women Voters will moderate the one-hour, live-cablecast event and she said Sunday night she would welcome questions from the public -- submitted as comments to this website. "I'd love it," she said. "I really would." The four candidates -- Tom Costley, Ron Turbin, Dusty Bahlman and incumbent Philip Guy -- are vying for two open seats on the five-member board in an election set for Tuesday, May 8. The one-hour event will begin at 7 p.m. in the selectmens' meeting room in Town Hall and will be carried live on Time-Warner cable Channel 17 to Williamstown cable TV subscribers. (GreylockNews.com will also audio record the event and will post a "podcast" on the web late in the evening for listening anytime). Skinner said she thought it would also be replayed on Channel 17 at 8 p.m. on Tuesday, and possibly at other times. Skinner will moderate the event, and expects to allow some time for questions from the public attending the limited-seating event. However, anyone can submit a question via this website. To post a question, click on the "Comments" link below and submit your question. Skinner said she would read GreylockNews.com on Monday afternoon and consider asking some of the questions. "There will be introductory statements and then I'll start off the questions with some that I have and there will be the opportunity for audience participation," said Skinner "People have to identify themselves but also regard it as an opportunity to ask questions and not make statements." Skinner said she hoped questioners would be brief to leave time for others. With 10 minutes to go in the event, Skinner will close questioning so that the candidates may make closing statements. WILLIAMSTOWN, Mass. -- Following a detailed story in the campus weekly, a web blog is inviting comment on the posting of two political flyers on dormitory room doors at Williams College. Here's a link to the original Williams Record story. And to the blog invitation. WILLIAMSTOWN, Mass. 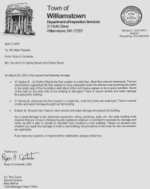 -- The Spring Street commercial building hit by a pre-dawn blaze March 29 is so badly damaged that rebuilding it will require renovations to bring it up to current building-code requirements, the town has told the o wner in a letter. The floor underneath the location of A Perfect Blend coffee shop "is a total loss," says the letter from deputy building inspector Ryan A. Contenda to building owner Mark Pareksy. "Most floor joist [sic] are destroyed. The two steel beams supporting the floor appear to have expanded under the intense head punching two holes in the south side of the foundation wall. Most of the roof trusses appear to be in good condition. Some of the wall of the west side of the building is damaged. There is severe smoke and water damage throughout the building." Williamstown, MA - Images Cinema's 24 Hour Video Goosechase and Free-For-All is scheduled to take place on Saturday, May 5 and Sunday, May 6. Make a video from scratch and see it on the big screen, all in 24 hours! It's simple. Come to the organizational meeting to receive the secret clues and rules of the game. As a group or individual, go out into the world and make a video, 5 minutes or shorter, and return it to Images Cinema on VHS, DVD, or mini-DV tape. There will be a public screening of all videos. Prizes will be awarded by a panel of judges, as well an Audience Choice Award. All ages and levels of experience are encouraged to participate! Receive the secret clues necessary to compete. Participants must provide their own equipment. Equipment and editing stations may be found at your local public access television station. North Adams, MA The Northern Berkshire Creative Arts will hold a grant writing workshop, led by Gene Wenner, for individual and performing artists, May 12, 9am to 12 noon, at the NBCA. Advance registration is required and the workshop fee is $10. This workshop is designed to provide visual artists, musicians, actors, dancer, writers and film/media artists with practical approaches to the research, design of proposal formats, and writing skills required for the development of effective grants proposals. Workshop participants will have the opportunity, outside of the workshop, to receive feedback on grant proposals they are in the process of writing. Gene Wenner is President of Arts & Education Consultants and has had extensive experience in arts administration and arts education. During his distinguished career, he held the position of Special Assistant in the Arts to the US Department of Education, Vice President of the National Foundation for Advancement in the Arts in Miami, FL, and Vice President of the John D. Rockefeller 3rd Fund’s Arts in Education Program in New York. 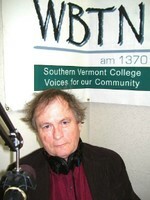 Wenner currently teaches courses at Berkshire Community College in Non-Profit Management and Governance. To obtain a registration form and for more information about the NBCA, upcoming events, and class schedules, visit their website, www.nbcreativearts.org, email rdewitt@nbcreativearts.org, or call the office at 413-663-8338. The NBCA is located in the Western Gateway Heritage State Park, Route 8 south, downtown North Adams. The Northern Berkshire Creative Arts, a non-profit community arts school established in April 2004, provides a broad range of studio classes and creative arts programming, both traditional and contemporary, to all members of the Northern Berkshires and surrounding communities. The NBCA encourages and nurtures the active participation in the arts for all individuals. The Drury High School Girls Softball Booster Club is holding a Spaghetti Dinner fundraiser on Thursday, May 3, from 4:00  7:00 PM at the North Adams American Legion. The cost is $6 for adults and $4 for seniors and children under 10 years of age. North Adams, MA - "Bible Studies", an interactive art installation by North Adams artist Robert Cubie, is featured in the Eclipse Gallery April 28 through May 20. The opening reception will be held Saturday, April 28 from 6:00  8:00 PM. The exhibit invites members of local churches to become a part of the growing art movement in North Adams. The show attempts to bridge the chasm that currently exists between many religious communities in America and the art world. Much contemporary art makes commentary on religion in America, and many religious communities in America have no participation in the visual art world, so a significant voice is absent from this discourse. The exhibit explores new ways in which contemporary art can be created in a Christian context. Using various methods of bible study, an activity prevalent in the Christian community, interactive pieces will be created that explore the relationship of the bible, various study guides, and individual reflection to examine how different denominations reach different interpretations of the same text and, through these interpretations, different understandings of God. The theme of the show is “the separation of the goats from the sheep.” It will explore such topics as the last judgment, the fruits of the spirit, the unforgivable sin, predestination, and sanctification. Robert Cubie is a North Adams-based artist living in the Eclipse Mill, and a regular attendant of the first Methodist Church in Williamstown. Having been raised in an Evangelical environment, his art explores the richness of that tradition, and both its positive and negative manifestations. The Eclipse Mill is at 243 Union Street and is open from 12:00  5:00 PM on Saturday and Sunday afternoons.